George R. DeBonis, 91, passed away on Tuesday December 25th at Queen of the Valley Hospital in Napa following a brief illness. George was a lifelong resident of Vallejo. He owned and operated Raymonds Men’s Wear from 1948-1980 and Angle & DeBonis Trucking from 1980-2000. 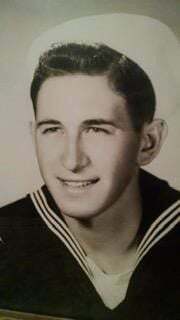 He was a veteran of US Navy and served during WWII. George loved fishing, hunting, the stock market and having coffee with his buddies. He was a former member of the Redman Club, 30-30 Club, Vallejo Exchange Club, Sons of Italy, Vallejo Elks Lodge and Chairman of the Board of Independence Savings. He was preceded by his wife of 67 years, Muriel DeBonis; sons, James & George Jr.; parents, Gaetano and Maria DeBonis; sister’s, Carmel Frank, Elsie DeBonis, Mary Troy, Florence Turek and bother, Danny DeBonis. Survivors include his daughter, Leslie (Bill) DeBonis-Taliaferro; grandchildren, Josh (Liz) DeBonis, Donnie (Kristen) Privett, Victoria Rossi and great-grandchildren, Luca DeBonis, Jackson and Colby Privett, Eaven Rossi-Mufich. He leaves behind numerous nieces and nephews and many friends, including Analy & Sam Feria. Friends may visit on Wednesday, Jan 2nd 4—8PM at Twin Chapels Mortuary, 1100 Tennessee St., Vallejo. Graveside Service with military honors will be held 11:00 AM Thursday, January 3rd at All Souls Cemetery, 550 Glen Cove Road; Vallejo with Deacon Mike Urick officiating.